Stone Fort, Pillar Stone, Souterrain and cup-marked boulder. The National Monument at Knockdrum is a hill-top circular stone fort. Approximately 29 metres in diameter the fort has thick walls some 3 metres wide and standing almost 2 metres high. 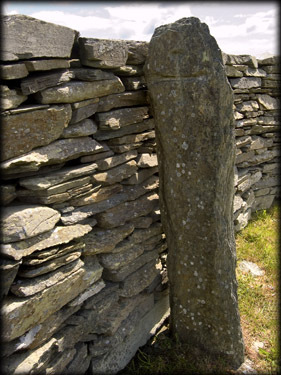 Access to the fort is through a narrow entrance on the north eastern side of the walls, as you enter there is a small guard chamber to the right and once inside the fort immediately to your left is a pillar stone, this stone has a deeply incised greek cross on the northern side and a narrow cross on the southern side. Inside the fort is the remains of a rectangular building, in one corners is a souterrain, it has a stone linteled roof and is rock-cut. 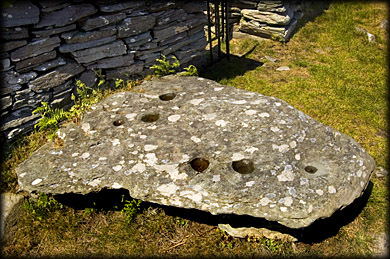 Outside the entrance is a flat boulder over 1.5 metres in length and more than 1.2 metres wide, the boulder is decorated with between 30 to forty cup-marks some of which can be seen in the image above. The fort was partially restored some time before 1860. 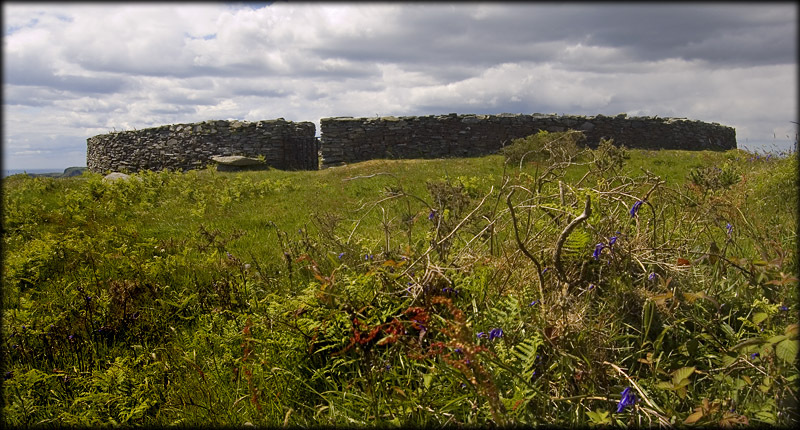 Situated: From Skibbereen take the R596 towards Castletownshend after 5K you will see a church on your right, drive 500 metres passed the church till you see a gate on your left and a farm track on your right, this takes you to stone passage way with steps leading up to the fort. Discovery Map 89: W 1716 3109. Last visit May 2007.